Understanding the effects - What are the impacts of consumption and consumerism in children? How does this relate to media? What are the impacts of consumption and consumerism in children? How does this relate to media? This chart shows how consumerism is affecting the world. 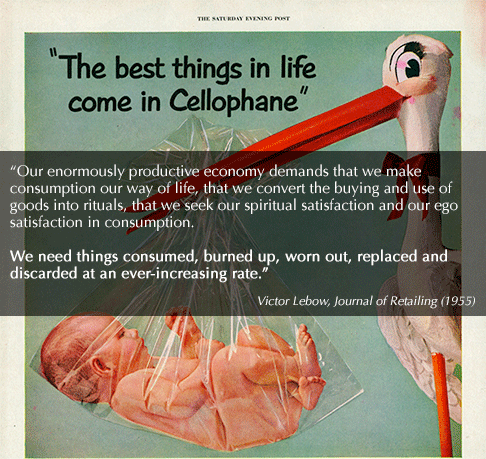 Consumerism is a vital part of our society and helps us create a good economy. However if taken too far we will see that consumerism will prove to be a heavy load and eventually lead to something that will impact globally. 2. $15-17 billion is spent by companies advertising to children in the US. Over $4 billion was spent in 2009 by the fast food industry alone. The media has become an overwhelming aspect to everyday life, we can see that people are turning towards electronics and media for work and entertainment. This not only impacts on the lives of adults but also affects children who are around them. When watching the TV the average person will see approximately 120 ads in an hour period. Channels specifically made for children used to only advertise what the new show is and what coming up next however now more infomercials and toy ads are surrounding children's entertainment time, in certain places in europe their are bans to the media stopping them from advertising directly at children.